I took the day off work on Friday to attend this years Belfast beer festival. It was in the Ulster hall again and I think it's a good venue for such an event, though there are a few little issues which I will get to. For me to get there involved about an hour and a half bus ride to Dublin, then a train to Belfast. Thankfully the walk from the train station is not too long and more importantly, I pretty much walk in a straight line. My destination was actually the Travelodge hotel. I walked towards the Europa hotel because I knew it was in that direction and was pleasantly surprised to walk by the Ulster hall on my left, a block away from my hotel. Checked in, all that was left to do was grab something to eat and head in to the festival. I could not find Boojum so I got a BLT from Reuben's gourmet sandwiches. It was actually rather good. I was in about an hour after opening time and it was pretty quiet, just the way I like it. I met up with a couple of Beoir members and then went to find Steve Lamond (beersiveknown) who was running around all weekend like a headless chicken. Steve was mad* enough to work at the event. We did our beer exchange, I might have come off the better here because I got three bottles of Hardknott beers and Steve just got the one, though it was a large 1 litre bottle of one-off beer. My first beer of the day was an APA from Dark Star. This was meant to be the beer of the festival according to Beer Nut so I made sure to get it before it was gone. It was a lovely beer, citurs heaven however there were others I preferred. One such was from a brewery called Summerwine from Yorkshire. Their Diablo IPA (4th in Richards list) was absolute heaven to me. Yes I love my over hopped American IPAs. They also had the wonderful Barrista espresso stout. I say wonderful because it tasted bloody great. That said, for me, I would not be able to drink more than a half because I don't drink coffee for health reasons. I am very much looking forward to more from this brewery. I am intrigued by their Teleporter ten malt porter which was unfortunately not at the festival. When I joined the Beoir contingent, Richard showed his inner beer geek. 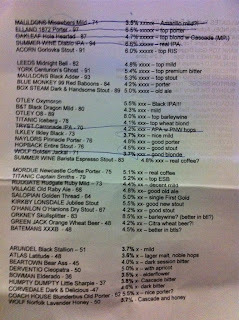 He had put together a list of all the beers at the festival, in order of how he wanted them, with their rate beer rating, abv and a quick description of what he expected from reading reviews. There were more on the other side of the page, but that was the avoid list. I took a picture of this page as it became a good guide when deciding on a beer. I made sure to do the top 5 at the very least, though I did not follow the list itself. Steve and I went off to Boojum for burritos at about 3pm. This is where I had dinner and brunch the next day as well. I love me a good burrito. As the day wore on, more and more people started to arrive but it was a Friday so we expected the place to fill up after 5pm when everyone got off work. And it most certainly did. By about 7pm it was quite difficult to get up to the bar and order a beer. It was also dinner time so a few of us left for dinner. Myself and an American Beoir member (Richard) had to have burritos so we went to boojum and the other two went for Chinese. We met up later at some bar down by Victoria square where we started a pint of a specially brewed beer. It was called something like 300 and brewed by Whitewater I believe. It was vile. When the other two showed up we hopped in a taxi to the John Hewitt. The John Hewitt is the first proper beer pub I have been to in Belfast. It is also only the second pub I can recall drinking in, the first was in the last paragraph if you can believe it. I went with a Hilden brewery beer called Halt. Having just looked it up on their website a few moments ago, I was very surprised to see it down as 6.1%? I picked it because I wanted something light, I should have gone for a copperhead (which I did next). I enjoyed the Halt, it was full of chewy caramel. I did think it was a bit heavy after all the beer I had already consumed. On a side note, there was an absolutely awesome Jazz band playing. This short video does them no justice whatsoever I'm afraid. I have no idea who they were but they look like they been playing together for 40 years. I left my friends and went back to the beer festival where Steve met me at the door and gave me a taste of a lambic that someone had made. I don't recall who brewed it but it looks like Steve will be writing about it soon. I had a few more beers and then back to the hotel at 11pm. Instead of talking about every single beer I tried, I will just list the beers in order and include a few notes. There is no point in taking proper notes for a review at a beer festival. You will do an injustice to many of the beers due to palate fatigue. Cask lager eh? Quite orangey. Somewhat buttery. Quite odd but tasty at the same time. Not sure how much I could drink though. Honey and lavender like. Bitter metallic but also blackcurrent. Lovely spicy coriander. Great with the burrito. Nice bitter profile. Now this was interesting. Andrew got a half pint of something and then without even driking it, fecked off for an hour and left his beer. Well we all had to investigate. This was a real blind taste as we had no idea what it was and all we could tell was it was dark like a porter/stout. The notes were: Lots of chocolate and coffee in the aroma. Slightest booze in the aroma. Caramel. Tastes lovely. Lots of caramel and brown sugar at first but then it changes to the coffee and bitter finish. Slight sour woody finish. It was bloody brilliant! When Andrew came back we discovered it was York Centurions ghost. This was listed as a dark mild? Anyway for all the drama and the fact it was lovely, I think this was one of my favourite beers of the festival. Sweet candi bitter earthy hops. Lovely bitter sweet hop profile. Love the lingering bitterness. Cascade hops? Lovely aroma. Smokey ash, burnt caramel, choc. The flavour lets it down somewhat. It's very thin. Amarillo hops? No sign of them. Feck all aroma. Some slight choc and coffee. Slight fruitiness. On tasting, boozy choc, bitter finish. Did I mention chocolate? Propper fruity American ipa. Full on tropical and forest fruits. Fantastic stuff. Possible beer of the festival for me. No orange at all. plenty of citrus. Vines galore. Very dry mouth puckering finish. Choc. Coffee. Lactic sourness. I quite like this beer, especially the sourness. Wow that's a very alcoholic beer. More so than stronger beers. Whiskey notes. Very interesting beer but more than a half pint not recommended. Choc caramel tannic quite lovely for strength. T full coffee. Slight milk but mostly black coffee. Steve poured me a full pint of this. I could not drink it all but that's not the fault of the beer. I almost shed a tear when I dumped half down the drain. 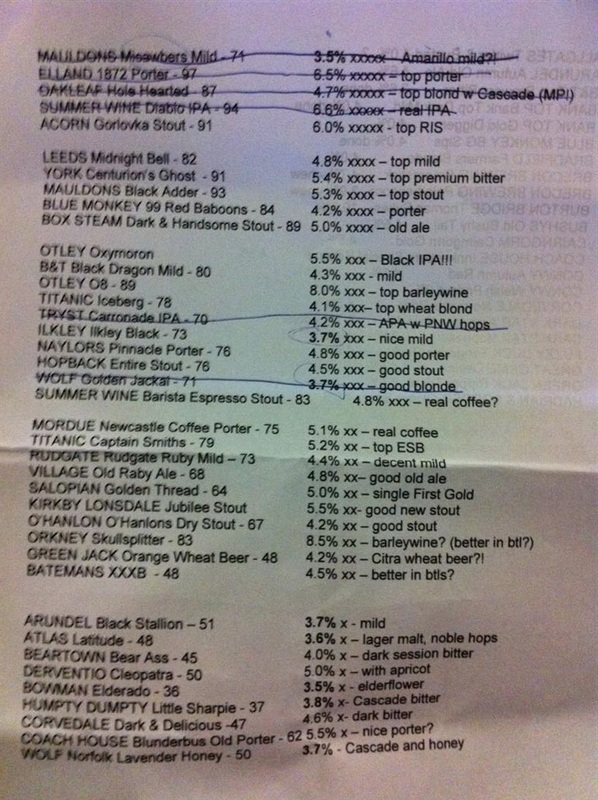 That's the list of beers (at the festival) I had the first day. 17 in total was it? I was a little hung over the next day, but only in the sense that I was dehydrated. No head or stomach issues. Some water sorted that out and then it was off to Boojum after I had checked out of the hotel. I can't think of a better brunch to be honest. Afterwards, I went back to the festival for a few hours. I was there from about opening until after the raffle (I did not win) at 16:30. This was a far more civilised affair which involved me sitting on my own, reading my kindle and jumping up for another beer every now and again. A very pleasant way to spend 4 hours I thought. Hoppy citric aroma. Very fruity. Some grapefruit. Somewhat tannic. Very dry finish. Sweet caramel makes it through the hops. Otley oxymoron see day one. I wanted more. Barley wine golden syrup apples. T instant sugar. Apples. Somewhat boozy. Strange spicy finish, almost chilli like. Boozy and warming, might actually be nice warmed on a cold night. Very Meade like. Not sure how I feel about it. Orange, crisp, biscuit. Citrus. Dry finish. Great session beer. Lovely hippy bitter dry finish. That was it, I then got the 18:10 train back to Dublin, then I got a 2.5 hour bus to Enniscorthy and spent the night with my dad. I got there at midnight. I could have almost flown to New York in that time. Same bus ride to Dublin the next day and about 1 hour 35 mins back home to my house then. The weekend was all travel and drinking and I would no have changed a thing. Well except for a limo and chauffeur of course. If my count is right, I got to taste 23 beers that were completely new to me. Not a bad two days work I think.